Rachel Portman had quite a year in 2000 (well in 1999 as well, for that matter, thinking about her score for The Cider House Rules) with two succesful and praised scores for The Legend of Bagger Vance and Lasse Hallström's latest film, Chocolat. The latter earning her an Academy Award nomination, but lost to Tan Dun, who surprisingly won a golden guy for his music for the hyped Crouching Tiger, Hidden Dragon. Portman's score for Chocolat is in the same vein as her score for Emma and her other romantic comedy scores (there's a hint of Only You in there, as well) - it has the traditional Portman sound, with the strong strings, and soft woodwinds. But Chocolat also has some French influences mixed in, which really is the largest reason this score is the lovely score I think it is - I find it easier to enjoy her music for Chocolat than her recent score for The Legend of Bagger Vance (which of course doesn't mean that I think the latter score is bad). Chocolat makes me happy, with its upbeat strings and woodwinds, and its playful quitar, violin, accordion, and ethnic flutes ("Vianne Sets Up Shop"). And let's not forget the charming main theme - a simple, but very lovely little ditty, it's hard not to like. The ensemble is mostly kept quite small, which creates an intimate score, with a very pastorale sound. It's really only in the last cues that Portman makes use of the sound of the full sympony orchestra. "Passage of Time" is a lovely little piece, performed mainly by light, bouncy strings, lively flute and supporting harpsichord. Very classical in its sound, this is one of the most entertaining cues on the soundtrack. The already mentioned "Vianne Sets Up Shop" is also very nice, with its ethinc influence, as is "Party Preparations" and the opening "Minor Swing". 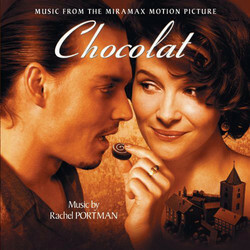 Whether Chocolat should have earned Rachel Portman an Oscar I don't know, as I yet have to see the film, but it sure is a excellent, charming and lovely score on CD, that fans of Portman's previous scores will have no difficulties enjoying.